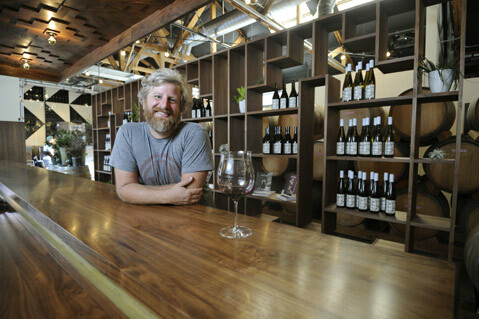 <strong>SMILES FOR MILES:</strong> After much popular success with his Municipal Winemakers brand in the Funk Zone, Dave Potter recently launched the single-vineyard-focused Potek Winery in The Mill on East Haley Street. When Dave Potter launched Municipal Winemakers in 2007, Santa Barbara’s wine scene grew exponentially cooler and infinitely more approachable. The brand’s colorful, stylish labels with names such as Bright White and Fizz settled with ease into his pioneering Funk Zone tasting room(s), where hipster-ish wine geeks sipped indoors and out on fresh, affordable wines that didn’t require special vocabularies to enjoy. Yet Potter didn’t want to just go down in history as the proprietor of the “cool guy” brand and was confident that he could make wines to compete with the upper-tier, single-vineyard expressions of the region. The Rancho Cucamonga–raised UCSB global studies grad boasts legit winemaking chops, having entered the industry at Sunstone’s tasting room in 2000, worked for Santa Cruz’s Byington Vineyard and Fess Parker Winery here, and toiled for six years in the cellars of Australia, where he also got a grad degree in enology and viticulture. So as Muni Wine rose in popularity and profitability, Potter simultaneously plotted a new project to more eloquently express Santa Barbara County vineyards such as Kick-On Ranch, Tierra Alta, and Sanford & Benedict that he’s come to know and love. The challenge is finding the right space. “Industrial space is tight and getting tighter all the time,” he explained. “The only way it works is if you can incorporate a strong retail component, as well.” And that’s not easy, either, due to the City of Santa Barbara’s strident policies on parking and visitation. In one of the more bizarre planning workarounds, Potek Winery features a stand-alone doorway to the bathroom, thereby officially getting around the maze of zoning rules. The Mill development, which will soon welcome Justin West’s barbecue joint Wildwood Kitchen and Kristopher Parker’s Third Window Brewing, is fraught with such creative solutions. But it is very much a working winery, as tasting-room visitors are separated from the barrels only by a see-through, polished wood cabinet. There, over sips of Potek’s riesling, pinot noir, grenache, and syrah, you will learn that the winery’s name is a nod to his great-grandfather, a Romanian Jew who emigrated from the homeland to America in 1917, changing his name from Berl Potek to Benjamin Potter. The man formerly known as Berl worked in New York City’s fabric industry — a trade followed by Dave’s grandfather and father, as well — and the labels reflect Romanian textile designs of yesteryear. By design, Potek is a bit more serious compared to Muni’s fun vibe, with fancy glasses and the ability to schedule a sit-down appointment with Potter himself. But Dave is such a genuinely jovial guy — even with his wife expecting their second kid during harvest, he was smiling steadily — it never gets too formal. Cheers to that. Potek Winery (406 East Haley St.;  931-6864; potek.com), which is open for tasting every day 10 a.m.-5 p.m., will be throwing a collaboration dinner at The Mill with the neighboring Third Window Brewery for St. Barbara’s Feast Day on December 4 as well as a pop-up dinner on December 11 at the Goodland Hotel in Goleta. Get tickets for both at muniwine.com.